“O healer, O God! Help from God and near victory and good tiding of the believers! O praised one [muhammad], O merciful one, O benefactor. There is no young man like the high one [‘ali] and no sword like the two-edged sword of the high one. O God, O living one, O eternal one, O Lord of majesty and honor, O merciful one, O compassionate one”. This is, of course, untenable. One gets in fact the impression of circular reasoning. Have a look at the kind of amulets Tawfiq Canaan, a rather famous collector of Palestinian folk art, had described. The respective publication of Dr. Heger with the title “yā muḥammad“– no „o Mohammed!” may be found here. This entry was posted in Academics, Islam and tagged Ali, amulets, Dhul fiqar, Inarah, Islam, Jesus, Muhammad, Tawfiq Canaan. Bookmark the permalink. 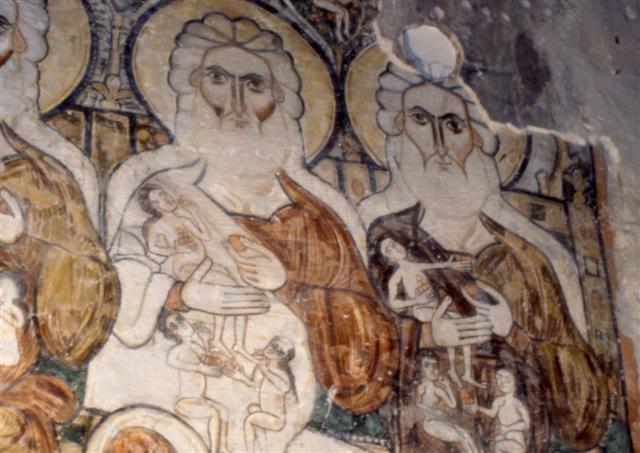 The picture displays a fresco from the Deir al-Surya monastry in Wadi al-Natroun in Egypt’s Western Desert from the 9th century. It shows the Patriarchs feeding the souls of the deceased in Paradise, allegedly with white grapes. Can anybody explain to me why the kind of amulets Tawfiq Canaan had described and are shown at the given URL http://virtualgallery.birzeit.edu/tour/coll_items?col_id=11091&col_title=The+Tawfiq+Canaan+Collection+of+Palestinian+Amulets should be an argument that the correct reading of the special talisman inscription I had presented be “untenable”. By the way, the scholars present at the orientalists’ conference in Otzenhausen by far didn’t find it “untenable”. An enriched version of my speech given there will be published in the proceedings of the Otzenhausen Conference in September 2008 by Markus Groß and Karl-Heinz Ohlig in the publishing house Hans Schiler Verlag under the title “Schlaglichter: Die ersten zwei Jahrhunderte” (http://www.verlag-hans-schiler.de/index.php?title=Markus+Gro%DF+Karl-Heinz+Ohlig+Schlaglichter+Die+ersten+zwei+Jahrhunderte&art_no=M0224) and later in an English version by the publishing house Prometheus.